Property Damage happens every day. Do you know what damages are covered under your home owner's insurance? 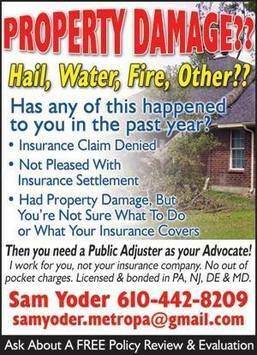 Sam is a licensed public adjuster. He works for the insured not the insurance company. He can review your policy and explain what is covered. He is not selling anything, he can recommend items your policy might be lacking to make sure that you have the proper coverages before you have any damage. If you have property damage he can assist you with your insurance claim and work to maximize the payment that your insurance company owes you. Call Sam first to realistically evaluate your damage and make sure your insurance company plays by the rules. No out of pocket fees. He can assist with any residential or commercial property insurance. A current claim, an under paid claim, or even a denied claim can be reviewed up to a year from the date of loss. Game of the season this week? This week could have provided the game of the season! All teams played very hard with heart and spirit. A double overtime win by the Bethlehem Bulldogs made it over the top!!!! Games are in order they were played. Click links below videos to watch full games.